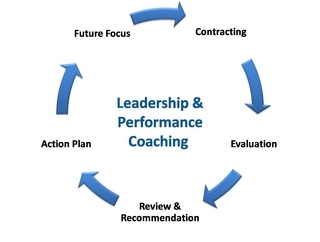 Our coaching mission is to address individual performance improvement needs by utilizing a Five Phase approach with a focus on assessment, empowerment and development as a foundation for lasting change. The underlying theme of our work is the critical challenge of personal accountability and decision making in the wake of today's profound workplace transformation. All of our work aims to empower individuals to control their work lives and consequently enhance both personal and organizational productivity. Our Coaching services are based on an in depth assessment of interactive abilities, personal style, values, skills and experience. We use the MBTI and DISC standardized assessments as a baseline and customize every program to the needs of each client. With productivity enhancement as the chief goal of the process, five phases are defined and implemented to ensure lasting value and impact. GOALS: Define development issues and build consensus around the coaching process, confidentiality constraints, outcomes and metrics. GOALS: Assess individual's career path with emphasis on values, skills, experience, style and career goals. GOALS: Candid feedback is provided and recommendations are linked to the appropriate course of action. GOALS: Define real worklife scenarios in which the new skills and recommendations can be applied. Observe and note new behaviors and progress and refine recommendations. GOALS: Create a six and twelve month action plan to help build a road map for success. Jump Start - A 30-day accelerated program designed to help surface key development issues and create a self directed action plan with metrics. Leadership Advantage - A 3-month program for creating meaningful behavioral change and career renewal. Leadership Edge - A 6-month program for achieving and sustaining peak performance in key leaders. Leadership Legacy - A 12-month program designed to assist the senior executive with creating and implementing a significant organizational transformation.